Travel is meant to be a rich experience, a means of engaging with culture, cuisine and pleasure. In the last decade, cities around the world have helped this along by building exceptionally designed, clean, well-functioning airports. 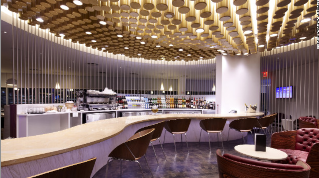 Along with them have come equally stunning airport lounges, and the super-luxe first-class areas in international hubs around the world are a testament to a new age of luxury. Instead of feeling like they're on the wrong side of a quarantine -- and serving decidedly lack-luster food (everyone's had a run-in with those dreaded airport "panini") -- these lounges are oases offering first-rate amenities, privacy and calm. It's all so good, in fact, you might even want to get to the airport early. Airports are gateways to the world, and these 10 airport lounges cater to global travelers who want the journey to be as memorable as the destination. JFK's Terminal 5, which includes the building formerly called the TWA Flight Center, serves as the airport's JetBlue Terminal. The space was designed by Finnish American architect Eero Saarinen in 1962, and was meant to look like a seagull in flight. The building's unique design has been used as a New York filming location for movies like Catch Me if You Can. Madrid is quickly becoming a major travel center in Europe, and besides being one of the easiest airports to navigate, it's also beautiful. Terminal 4's architectural highlights include colorful steel pylons supporting a bamboo ceiling that lets in sunlight with the aim of creating a tranquil and calming space for passengers passing through. Beijing International Airport's Terminal 3, opened for the 2008 Olympics, is one of the largest buildings on earth. From the sky, the structure is meant to resemble a dragon adorned in the traditional Chinese red-and-yellow color scheme. Huge skylights let in plenty of natural light, and the entire terminal is color-coded to help passengers navigate it effortlessly. Denver International Airport's iconic peaked fiberglass roof is meant to resemble the Rocky Mountains. Interior details throughout the airport have sparked numerous conspiracy theories -- everything from supposed Templar markings in the floors to the theory that the airport serves as the secret headquarters for the Illuminati. Incheon International Airport often finds itself at the top of best airport lists across the globe, and for good reason. Architecturally, it looks like a futuristic spaceport, and inside, you'll find a Korean bathhouse, ice skating rink, movie theater, shopping mall and free shower facilities. The white facade of Marrakech Menara Airport features intricate cutout patterns on the roof overhand that filter the sunlight beautifully. The arabesque patterns paired with the shape of the building blend modernism and traditional Islamic design flawlessly. Changi Airport's Terminal 3 in Singapore features an impressive roof composed of more than 900 skylights, each adjustable to let in the perfect amount of light, as well as a five-story vertical garden in the baggage claim area. Indoor gardens scattered throughout the airport lend a calming atmosphere to this busy hub. Located on a tiny island, Hong Kong International Airport makes you feel like you're about to land on the water instead of a runway, and the view coming in is spectacular. The interior is super easy to navigate, and you won't have to wrestle your luggage up or down any stairs or escalators between your plane and the express train to Hong Kong. Sondika Bilbao Airport is nicknamed "La Paloma" due to its resemblance to a dove taking flight. The steel and concrete structure integrates into the surrounding green hills near Bilbao, and the minimalist and sculptural four-floor departure hall gets a healthy dose of natural sunlight throughout the day. Architect Rafael Vi�oly tipped his hat to the design of JFK Airport circa 1960 when he designed Carrasco International Airport in 2009. The curves of the interior are smooth and easy on the eyes, and the departure hall is filled with natural sunlight. Terraces and lounges throughout the airport provide comfortable places for passengers waiting to depart or families waiting to welcome a loved one home.